Mercedes Cachago - From Ecuador with Magic! “This web page provides information about the artist Mercedes Cachago Lokrheim. It contains samples of Mercedes’ paintings, some still available, while others are sold. 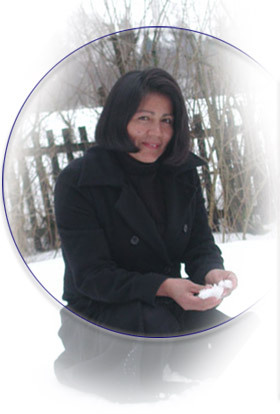 Mercedes has her roots in Ecuador, but currently lives and works in Norway. She has a Studio at the "Glasslåven Kunstsenter",� at the historical and cultural site Granavollen in the region of Hadeland. She is one of a select group of respected artists with a variety of specialties. Mercedes is currently working on large projects, one of which is an international exhibition where the theme is to focus on the impact of the exploitation of oil in environmentally sensitive areas, highlighting Yasuni National Park in the rain forest in Ecuador, and Lofoten, a peninsula in Northern currently dependent on fishing. To purchase a painting please contact us and we will provide information about a gallery where you can do this. Glasslåven Kunstsenter being one of these"
Please click here for the official invitation letter NO. Mercedes has one ongoing exhibition hosted by Glasslåven Kunstsenter which had the inauguration date on 23th of November 2018 and will last until 17th of February 2019. This years winter exhibition is called "Noruega Mia" which means My Norway. At the exhibition the public will be able to see a new variety of Mercedes's illustrations. The paintings shows intensive brush strokes and strong colors. For this years "Potetfestival" in Hadeland, Norway. Mercedes got the honor to create the logo for this years aquavit which was released during the festival. The original version of the logo(See the picture below)is available during the winter exhibition. During the exhibition we are introducing Digigraphies to the custommers. We produced an exclusive, enumerated selection which is available to public as well. Oslo, Norway. 01.12.2018 - 17:00.